Alexandria Ocasio-Cortez: "I Am as Powerful as a Man and It Drives Them Crazy"
In her first two months as a congresswoman, New York Representative Alexandria Ocasio-Cortez has gained more political ground for the left than most freshman lawmakers, and indeed more than some veterans of the Democratic party. Ocasio-Cortez has proposed a resolution on the Green New Deal, advocated for a 70-percent marginal tax rate, educated the public on the broken nature of our campaign finance laws and continually pushed debate to encompass more progressive views. All this has Republicans, as well as swaths of the Democratic establishment, scared senseless. “The idea that a woman can be as powerful as a man is something that our society can’t deal with. But I am as powerful as a man and it drives them crazy,” Ocasio-Cortez told New Yorker editor David Remnick. Apparently, I am a cow dictator. What’s humorous to me is that we’re finally proposing a clear, ambitious, but necessary and grounded policy on the scale of the problem. And so it’s hard for the Republicans to refute the actual policy on its substance. They resort to mythologizing it on a ludicrous level. Ted Cruz says we want to “kill all the cows.” How far have we slid in our discourse? But that’s what half our political representation is up to. 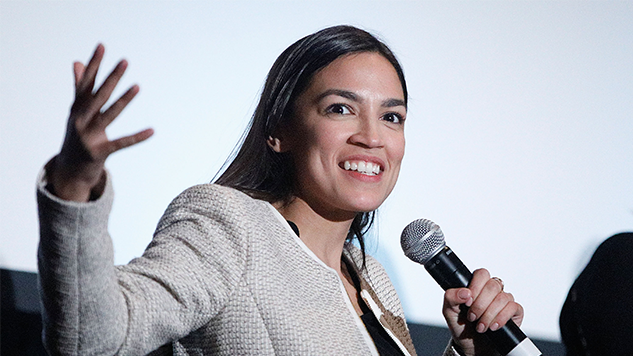 Her visibility as a congresswoman, whether through her active social media accounts or pointed questioning of Michael Cohen last week, has emboldened some to attack Ocasio-Cortez for things as trivial as a video of her dancing in college. Fox News has predictably seized on the freshman Democrat as a target, presumably in large part because she is a young woman of color. Attacks against the Bronx and Queens representative have even crossed over into the territory of domestic terrorism. I’ve got a full-time job in Congress and then I moonlight as America’s greatest villain, or as the new hope. And it’s pretty tiring. I’m just a normal person. I knew that I was not going to be liked. I’m a Democrat. I’m a woman. I’m a young woman. A Latina. And I’m a liberal, a D.S.A. [Democratic Socialists of America] member. It still feels terrifying every time. I am trying to pick my battles, but, until there are more people running toward the fire, it’s hard to take a break. The good news is that there seems like more people are running toward the fire. It’s scary running into a burning building. But what is the choice? It can’t be understated how imperiled our democracy is right now. It’s heartening to know Ocasio-Cortez still has at least 22 more months in office to drive the right “crazy” and act as a legislative firefighter.